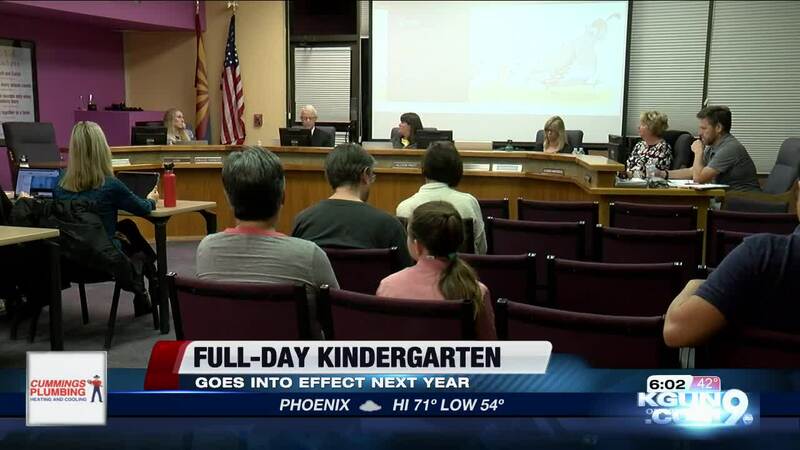 VAIL, Ariz. - The Vail School District governing board unanimously voted in favor of extending half day kindergarten classes throughout their schools to full-day kindergarten at no cost to parents. The decision was made during a board meeting on February 12. Vail School District Superintendent Calvin Baker told KGUN9, the decision to bring his option to the board was first brought to them by kindergarten, first and second grade teachers. "The compelling argument came from our primary teachers and our elementary principals who in prior meetings very convincingly told the board that students who go a full day are better prepared and do better academically and socially than students who only go a half day," said Baker. In a statement posted to Facebook, Baker said if full-day kindergarten were to be implemented the district would have a certified teacher teach academics during one half of the day and another instructor, who could possibly not be certified, teach social skills. Baker added the change will cost the district close to $600,000, which he says they plan to pay for this with more new revenue coming in from the state. The change will not be implemented until the next school year, according to Baker.